MIRA Live Visual Arts Festival arrives to Berlin. It will take place on Saturday, June 11th, at the Funkhaus Berlin, a refurbished historical building that used to be the headquarters of the former GDR radio, featuring audiovisual shows, installations, conferences, workshops, and the MIRA Dome, the immersive stage focused on 360º projections and surrounding sound that was already premiered in Barcelona’s 2015 edition. MIRA Berlin is born with same festival goals: to be a leader in the distribution and display of artistic proposals that link visual arts and live music and also with the aim of getting a close approach into Berlin’s skilfull talents. MIRA, with five past editions, bets for one of the most important cities of European culture, an artistic point of reference, indisputable pole of attraction and cultural creativity. The Barcelona festival team has chosen Funkhaus Berlin because of the features of its spaces and the possibilities offered by this emblematic location of the German capital, located in the East side of the city on the banks of the Spree river. This venue, full of great architectural load, will be hosting part of the program while the MIRA Dome will be located on the outside of the enclosure, a symbol of German building design. 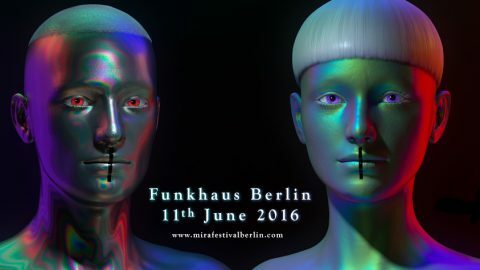 During the next weeks, MIRA Berlin will announce its line-up and tickets for the event will be on sale. For this first edition of MIRA in Berlin, the festival continues the graphic campaign used during 2015 in Barcelona: She and He, artificial beings -She born in the deep sea and He in an arid-land monolith- that met at MIRA Barcelona, are now traveling to the German capital. The festival’s image, created by Device studio, adopts cooler, metal colors for this first edition.